Everything you need but the water! A unique, reusable painting activity. Apply water to the sheet and the image appears! Perfect for all ages and ability levels. 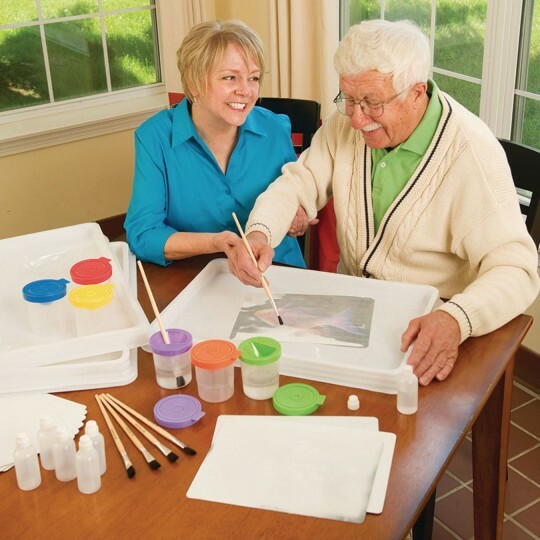 Easy Pack includes brushes, daubers, trays and cups! Water and a paintbrush are all you need! Aquapaintings are perfect for artists of all ages and ability levels. Simply brush water to the sheet and see the image magically appear. After each use the image will slowly fade away until it’s a blank canvas ready to be reused! Image mats measure 8-1/4” x 11-1/4”. 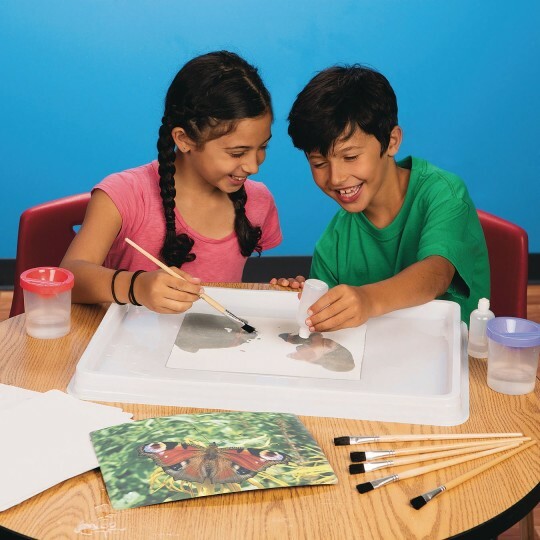 The Easy Pack has everything you need but the water: 24 Aquapaintings (2 each of 12 designs), 6 quality easel paintbrushes, 6 water dauber bottles, 6 handy art trays and 6 great no-spill water cups. This was amazing with my residents with dementia! Its definitely something I think every nursing facility should have!!! a must buy! Watching the joy on the faces of people who begin to see the picture once painted has been a delight. We use this for person's with Mod to Severe Dementia who can no longer paint creatively on their own. Because we don't segregate group painting everyone feels like they are doing an amazing job. This was absolutely amazing. Our friends who reside at our facility who have early to moderate stage dementia loved it! They were able to use either the brush or water bottle provided to discover what was beneath the paper. They smiled laughed and felt accomplished. Not to mention the great fine motor and cognitive aspects that were applied. It was a win win! Merchant response: Thank you for your feedback. Based on your review and feedback from other customers, we've addressed the quality of the paper and have replaced the stock so this will not be an issue for future customers. Thank you for helping us make our products the best they can be!